If the multitude of units used to describe lighting confuses you, this lumen calculator will surely be of help. You can use it to convert between three most popular units of measuring light: candelas, lumens, and lux. In the article below, we will provide you with some handy formulas that make lux to lumen conversion a piece of cake! Lumens are a unit of luminous flux, or, in more understandable terms - the total amount of light emitted by a source. Lux is a measure of the illumination of the surface, or, more clearly - how much light is received by a surface. Candelas are the SI units of luminous intensity. It is the light emitted from a source in a particular direction, that is - per steradian. Both candelas and lumens are units of emitted light. Knowing one of these two values (either the luminous intensity or the luminous flux), you can easily convert to the other one. As we mentioned before, candelas are a measure of light emitted per steradian (unit solid angle). It means that this value is independent of the directions in which the light is emitted. Lumens, however, are the total amount of light emitted and depend on the type of light source. For example, a star shines uniformly into all directions. A directional LED lamp (spotlight), however, might give light only to a small area around it. For a light source that emits light uniformly in all directions, Ω = 4π. Steradians are a unit of measuring angles in a 3D space (just like radians for a 2D space). One steradian on a sphere with a radius of one meter gives a surface of one m². the axis at which the light achieves 50% of maximal luminosity. It is also possible to convert between lux and apparent magnitude of a star. The apparent magnitude tells us how bright does the star appear when seen from Earth. For example, a star of apparent magnitude 0 is about 2.08 microlux. The brightest star in our night sky, Sirius, has the apparent magnitude of -1.46, equivalent to 8.17 microlux. 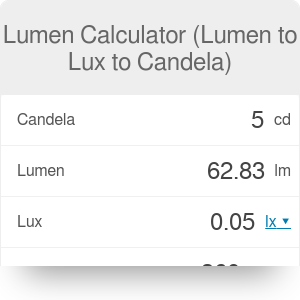 Last but not least, you can use this lumen calculator to convert lux to candlepower (that is, to candelas). As you already know, candelas measure the light emitted in a particular direction, while lux measure the light received per unit area. Lumen Calculator (Lumen to Lux to Candela) can be embedded on your website to enrich the content you wrote and make it easier for your visitors to understand your message.